Laurelhurst Craftsman Bungalow: Made Craftsman Stencils! 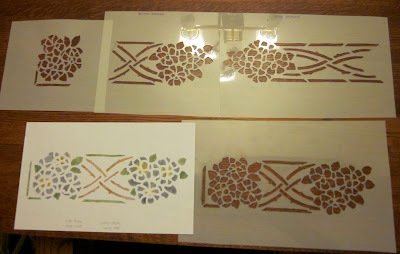 When Sharon got her new stencil making supplies in the mail yesterday, she couldn't resist making some stencils! Besides, it was nice to have some time off of bending over the too-low table where we've been working on the leaded glass project. This is the probable color scheme for the dining room curtains. She purchased blank mylar and a stencil cutting tool from Stencilease. Though, it doesn't actually cut; it really melts the plastic along the line where you drag the heated tip. It works pretty well, though the melted edge of the stencil isn't as smooth as when the plastic film is cut. But it definitely does the job faster than a craft knife. Sharon also found it helpful to tape the plastic mylar to the back of a cookie sheet, because then she could hold it in her lap and rotate it as needed. The activity is pretty compatible with "watching" TV (OK, really listening to TV). As mentioned earlier, she chose this design from the article "Draperies for the dining room: designs in stencil and embroidery" from the October 1910 Craftsman Magazine. Very cool! You sure are keeping busy!